The longboard is a versatile piece of equipment that can be used for sport, as a way to commute or as a hobby. Most recently electric longboards have been on the rise as they’re an effective, minimalist way of getting around, and companies have been emerging left, right and centre with their latest line of products. Longboarding differs from skateboarding in that the deck is usually larger and the wheels are bigger and softer. However within the longboarding umbrella term there are many different types of longboards that are streamlined for different uses. There are so many great boards out there, and the most important thing when purchasing an electric longboard is to know what you want, as not all longboards are the same, nor do they provide the same experience. Within our list of best electric longboards we’ve broken it down into subsections that will help you get the best ride possible! A longboard is a subcategory of the skateboard, except we all know when you think of a skateboard, you think of your bog standard one. Longboards are flatter, longer and larger than your average skateboard. They are usually found at around 33” and can go all the way to 60”, the deck is also wider, and the wheels range from soft and flexible for downhill racing, to harder for cruising and freeriding. 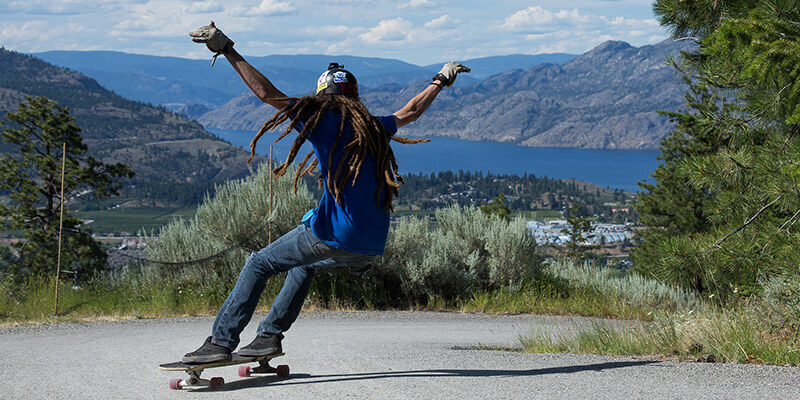 Longboards were designed for cruising and travelling big distances, therefore the wheels are also large so more ground can be covered and more speed gained. The length and width of these boards are for stability when riding, and though this size results in a heavier and larger board, this also means it’s easier to control and are more comfortable due to the amount of space for your feet. Originally skateboards were designed for doing tricks and freestyling, so they have a small deck (usually around 28” to 32”) and small wheels, and have curved ends known as kicktails, which makes it easier to perform ollies and flips. Electric skateboards aren’t too different – they’re easily maneuverable and are a lot of fun experimenting on. Longboards on the other hand are better for distance and downhill racing. They have a large deck and wheel diameter, which means more ground coverage and a higher top speed. They have no kicktails as they aren’t design for doing tricks on, and have decks usually made of bamboo for strength and durability. Electric longboards are often designed with as little as possible taking away from the original longboard aesthetic, so minimal changes are made to the overall look. The foot space and large wheels make them great for commuting or for anyone who does a lot of travelling, so if that’s what you’re after then an electric longboard would be perfect for you. If you’ve ever watched a Casey Neistat YouTube video you’ve probably at some point developed a deep desire to weave your way around NYC on a black and orange bamboo electric longboard. 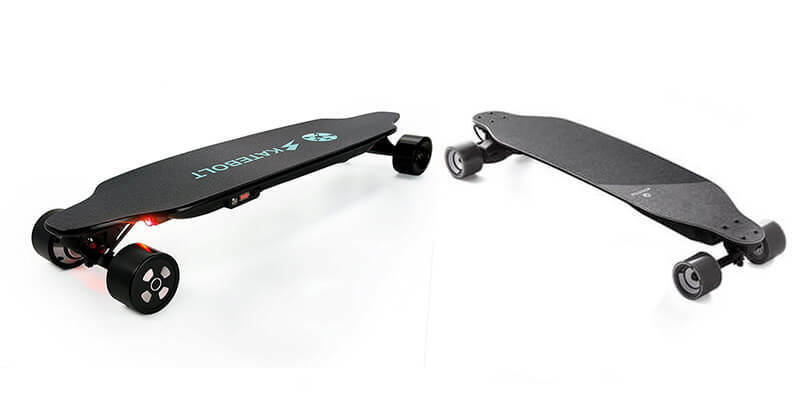 I can’t blame you as Boosted have monopolised the electric skateboard industry, and for good reason, so we chose the Boosted Stealth to put on this list. Boosted have stated that they took inspiration from snowboards when designing this board. They’ve created a deck with reinforced fiberglass to create strength without making it bulky, and a maneuverable, flexible deck that carves beautifully and contains lightweight foam that absorbs shock. This Boosted board has the most amount of riding modes to date, and its top speed comes in at 24 mph available in its 5th riding mode – Hyper mode. The acceleration is rapid, and it almost threw me off the board on my first try. You’ll be able to travel up to 14 miles on the 85mm wheels. The belt driven 2,100 Watt motor will get you up gradients of up to 25%, and produces stronger braking and faster acceleration when compared to the hub motor. Without sounding like too much of a disciple, I love this board. The deck is wider than previous boards, giving you more space to experiment with the pristine carving and flex this board outputs, the acceleration is fast and extremely satisfying, and the responsiveness is great. This is the pinnacle of high performance. For anyone looking to just have a fun experience on an electric longboard, the Huracane is your purchase, this board is great for beginners or anyone who doesn’t take longboarding very seriously, and can be found at around $300. The 38” deck is made of a combination of maple wood and bamboo and the choice of a 350 Watt hub motor rather than a belt driven motor allows the board to be slim and flexible. The board has a range of 6-8 miles and a top speed of 17 mph, and it goes from empty to fully charged in 3 hours. You’ll find the battery spanning the underside of the board, but aside from that you won’t find much giving away that it’s electric – it could easily pass for a normal longboard. The remote provided has a power button, battery indicator, forward/reverse toggle and brake lever. The Blitzart Huracane has a strong deck with solid bearing, the ride itself is fast and exciting, with one small complaint being it slows down somewhat when going up hills. 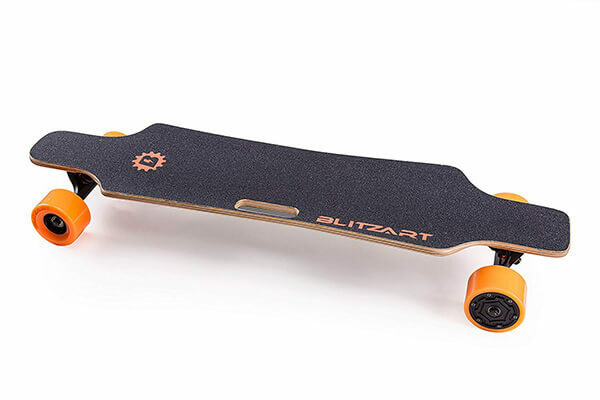 However, ultimately I think this board is a bargain, Blitzart have managed to provide an electric longboard on the lower end of the price range with a solid performance and good build quality. We also featured the Blitzart Huracane in our best electric skateboards under $300 post. Evolve’s Carbon series was designed for range and performance. Coming in at 40” (102 cm) long, with a carbon-fiber deck, this board is in it for the long haul. The extra long deck and tough material mean the Carbon GT excels in stability and is absolutely perfect for longer journeys. 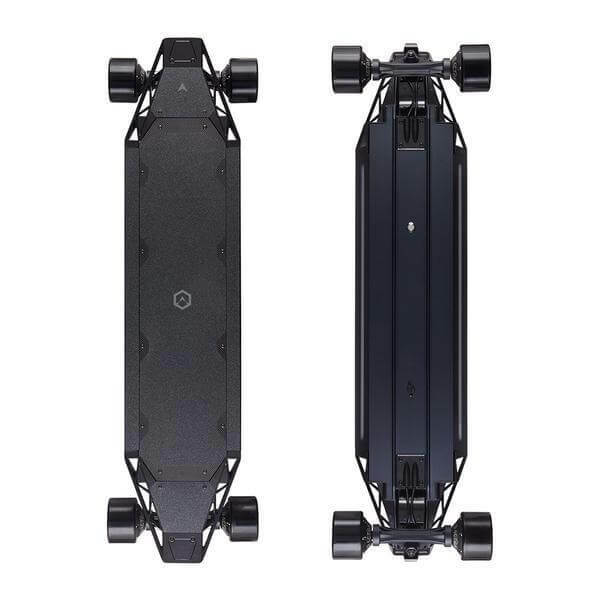 The result of the carbon deck is that it is less flexible so it’s not what you’d want if you were looking for a purely off-road electric longboard, however the solidity of it means you’ll look and feel more secure at higher speeds. 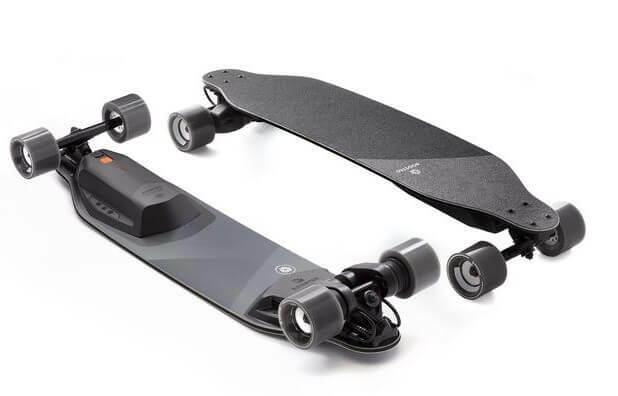 The Carbon GT has one of the largest batteries of Evolve’s electric longboard selection, you’ll be able to travel up to a staggering 31 miles. This board has a powerful motor (3,000 Watt) and will get you where you want to go fast, with a top speed of 26 mph. It pretty impressive hill climbing capabilities, and it can even managed to get up a 25% gradient without much drop in performance! Something special about this board is that the electronics are built into the deck, and therefore aren’t stored in a case under the board like Evolve’s other longboards. This is great for someone looking for a good aesthetic for their board, the carbon-fiber combined with the in-built electronics gives the Carbon GT a sleek, attractive look. One of the best features of this longboard is that it comes with two sets of wheels. One set of standard evolve 83mm street wheels and a set of 7 inch off-road wheels that mean you get the best of both worlds with just one purchase. The Carbon GT is a very impressive board, you’d really have to put it through its paces before you saw any cracks start to show. But for this kind of quality you’re going to have to pay a premium. The cheapest we’ve seen this board is close to $2,000. Despite the price the large range is perfect for anyone who will be using it every day. If you feel like you’ll be getting the most out of this powerful longboard then we think it’s well worth the price. The overall quality shows that Evolve are really striving to not only be on par with Boosted board, but generally create a vastly superior product. The Evolve Bamboo GTX is a pricey all-terrain electric longboard. It’s the successor to the Bamboo GT, having more power and performance. It’s also been described as having ‘all of the best features of the Carbon GT’, the more expensive big brother we mentioned before. Like the Carbon GTX this board is often sold as a 2-in-1 package, with replaceable wheels to make it more ‘street’ friendly, the one we are reviewing here is the off-road one with beefy 7” wheels. The Bamboo GTX is eye-catching and impressive, with big all-terrain wheels, a flexible bamboo deck with a gold and black colour scheme, and large trucks to show that it means business. The performance also managed to catch me off guard, with gold plated 3,000 Watt dual motors that takes some getting used to, it has a powerful acceleration and manages to travel over gravel, dirt, grass and even up some pretty steep inclines with ease. The GTX has a top speed of 22 mph (35 kph), and 25 mph (41 kph) on a good day, and a range of around 18.5 miles (30 km). 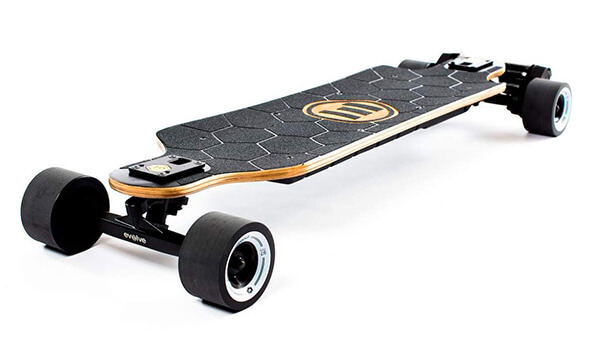 This board is around 21 lbs with the all-terrain wheels, and aside from the wheels it looks pretty inoffensive, Evolve were clearly going for a chilled out, ‘could be a normal longboard’ vibe. The all-terrain aspect of it doesn’t stop it from blending in with city life, due to its lightweight, flexible bamboo deck, and you could easily use this as both a street and off-road board. We really like all the offerings that Evolve have put out so far, and think that they are really the ones to watch at the moment when it comes to challenging Boosted to the crown of the best electric longboard. The Acton Q4UTRO (Quatro) is a 4-wheel drive electric longboard, and yes, it is as much fun to ride as you think. The Acton Quatro is the world’s first 4-wheel drive electric longboard, with the 4 hub motors happily powering you with 2000 Watts up inclines of up to 30%! The deck is made up of carbon-fiber and aluminium therefore it isn’t very flexible. During my test ride the suspension held up well, getting me over bumps and cracks with no fuss. This board has a 22 mile range and the handy battery-saving regenerative braking, which adds back to the battery life whenever you brake. It has a top speed of 23 mph, and a charge time of 3 hours. Coming in at around 24 lbs, it’s one of the heavier boards on this list and from personal experience you can definitely feel the weight when you pick it up. The LED lights are a great addition, and you’ll find them on every side of the deck, all white except for red ones on the back – perfect for night time rides. I see the Acton Quatro as somewhat of a dark horse, this board is really amazing and I’d love to see it getting more recognition. It is, of course, very powerful and also has great responsiveness and a battery that lasts way longer than you need it to, even when journeying up steep hills. Use the link below to get $20 off your purchase! Check the latest price on the Acton Website. We’ve mentioned the Halo Board 2 quite a few times on AltRiders. It’s one of our favorite electric longboards that you can buy right now and is currently our top rated one. In this post we’ve mainly focused on other electric longboards but we couldn’t finish this post without a quick mention of the Halo Board. This is a fully carbon fiber electric longboard that weighs only 14 lbs despite having an awful lot of power! 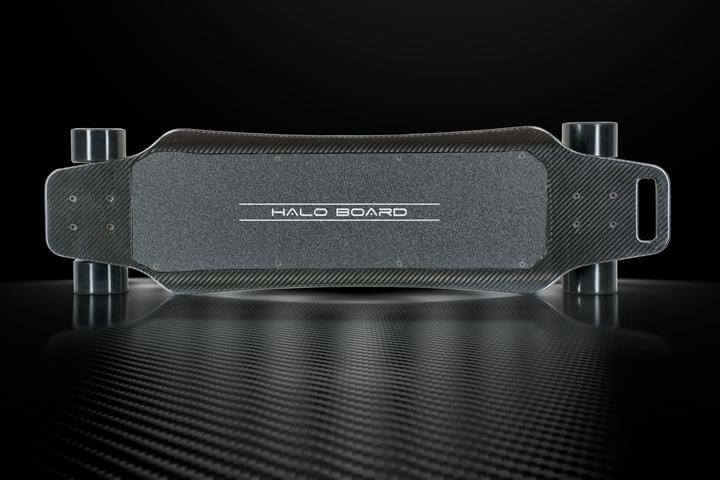 The Halo Board 2 has a dual motor system that provides a staggering 3000 W of power whilst staying virtually silent. 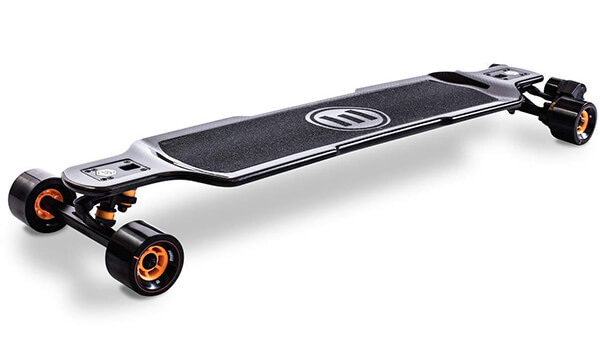 This means it can reach a top speed of 22 mph, but it can also keep doing a very high speed up hills due to the huge amounts of torque, which many of the other longboards simply can’t do. It’s officially rated at being able to climb hills of 25 degrees but is capable of a bit more than this. It also has a range of 14 miles and includes a regenerative braking system to help top up the battery during riding. What really stands out with the Halo Board 2 is the attention to detail and the little extra features. For example, one of the best features we’ve seen so far is the simple handle at the top of the board. It’s surprising how much it gets used when its there. You simply don’t realise you need it until you have it. Another nice feature is the fire safe battery, a nice safety feature that is rarely seen. Through purchasing an electric longboard you broaden your horizons with where and how you travel. I personally use my electric longboard to commute and love my journey to work, but buying one for a sport or a hobby will be equally as fulfilling if you know which one to purchase. You have a lot to choose from as electric skateboards and longboards get more popular, however this means the market will ultimately begin to saturate with sub-par products, and there are definitely a few out there right now. Hopefully this list helped you out! Great list! Always interesting to see what riders think about cheaper boards, and if it’s worth saving money to sacrifice some performance and quality.